Professor Michitaka Hirose at the university’s graduate school of information science and technology said he was interested in how computers can be used to trick the human mind. 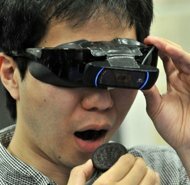 “How to fool various senses or how to build on them using computers is very important in the study of virtual reality,” he told AFP. Hirose said standard virtual reality equipment that attempts to cater to complex senses like touch often results in bulky equipment. But he said using one or more senses to fool the others was a way around this problem. “Reality is in your mind,” he said. Hirose says experiments so far have shown 80 percent of subjects are fooled. The team has no plans as yet to commercialise their invention, but would like to investigate whether people wanting to lose weight can use the device.